Since 1907, Mrs. Schlorer’s Mayonnaise has been a Philadelphia Tradition for great tasting food such as sandwiches or potato salad. 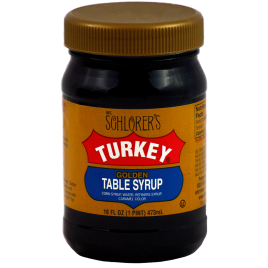 Since then, Mrs. Schlorer’s Turkey Table Syrup has also become associated with Fastnacht Day as well as for baking shoofly pies or simply as a topping on bread with peanut butter. Bring home the history and tradition with Mrs. Schlorer’s. Update: In an effort to deliver safe, healthy products that align with the companies’ core competencies, the management team at Good Food, Inc. has recently made the decision to discontinue the Mrs. Schlorer’s Mayonnaise product line. We would like to thank you for your patronage and apologize for the inconvenience. 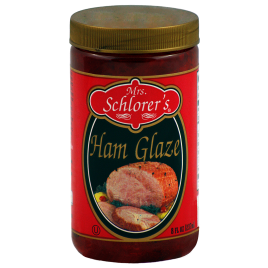 Spoon Mrs. Schlorer’s Ham Glaze over baking ham, parboiled yams or sweet potatoes for a delicious holiday meal. Ham Glaze is also tasty in a ham or turkey sandwich – spread a thin layer on your roll and enjoy!